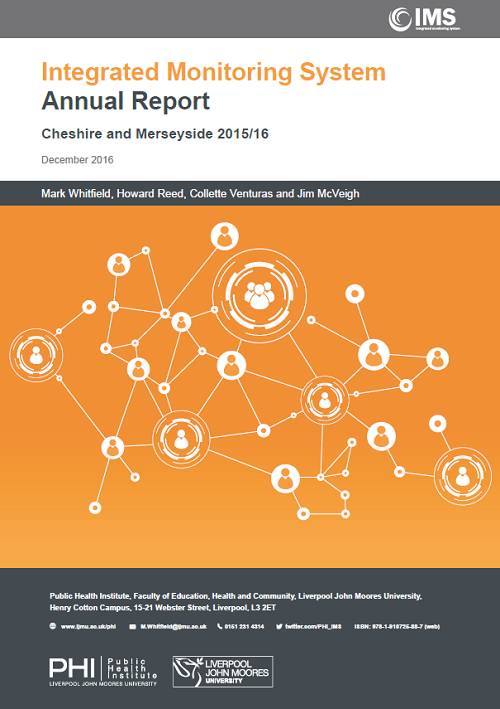 The annual report for the Integrated Monitoring System (IMS) details activity delivered during the 2017-18 financial year by 50 drug and alcohol services and 95 pharmacies across Merseyside and Cheshire. The report provides information on presentations to needle and syringe programmes (NSPs) and other low threshold interventions delivered to individuals using drugs and/or alcohol, focussing on areas such as wellbeing, demographics and substances used. The data is presented in three distinct cohort groups. 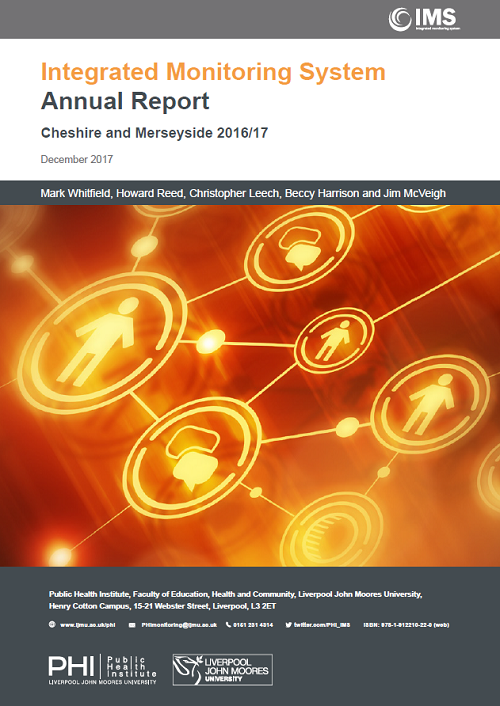 The annual report for the Integrated Monitoring System (IMS) details activity across Merseyside and Cheshire over the period of the 2016-17 financial year. The data is presented in three distinct cohort groups; (1) individuals injecting psychoactive drugs, (2) individuals injecting steroids/IPEDs, (3) individuals accessing support related to alcohol or non-injecting drug use. Data from IMS is also cross-matched with the National Drug Treatment Monitoring System (NDTMS) and the Criminal Justice Dataset to provide a complete picture of activity within each of the nine Local Authority areas in Cheshire and Merseyside. 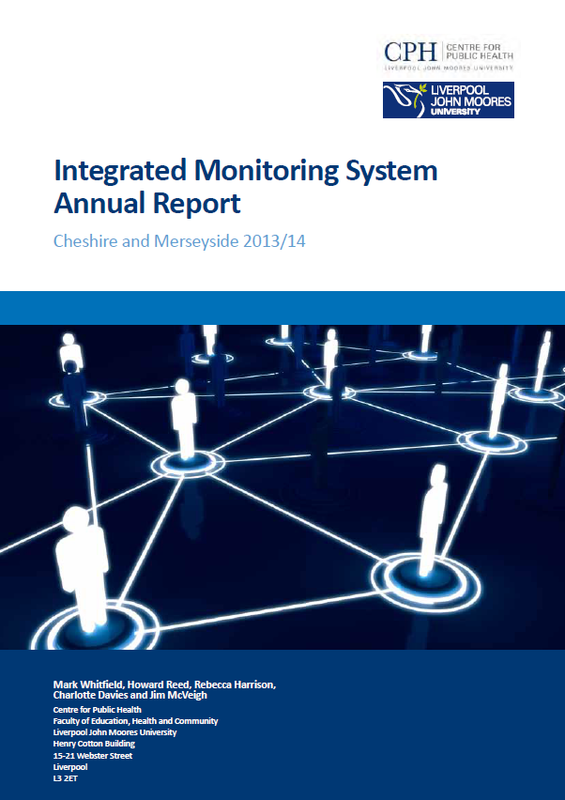 The annual report for the Integrated Monitoring System (IMS) details activity across Merseyside and Cheshire over the period of the 2015-16 financial year. 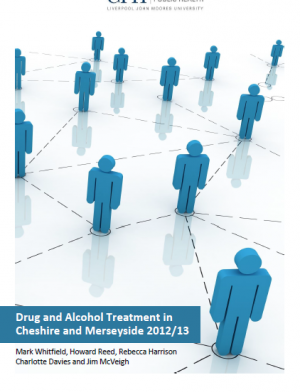 The data is cross-matched with figures from the National Drug Treatment Monitoring System (NDTMS) and the Drug Intervention Programme (DIP) to provide a report inclusive of every individual in contact with any drug or alcohol treatment/low threshold or syringe-exchange service in each of the nine Local Authority areas in Cheshire and Merseyside. 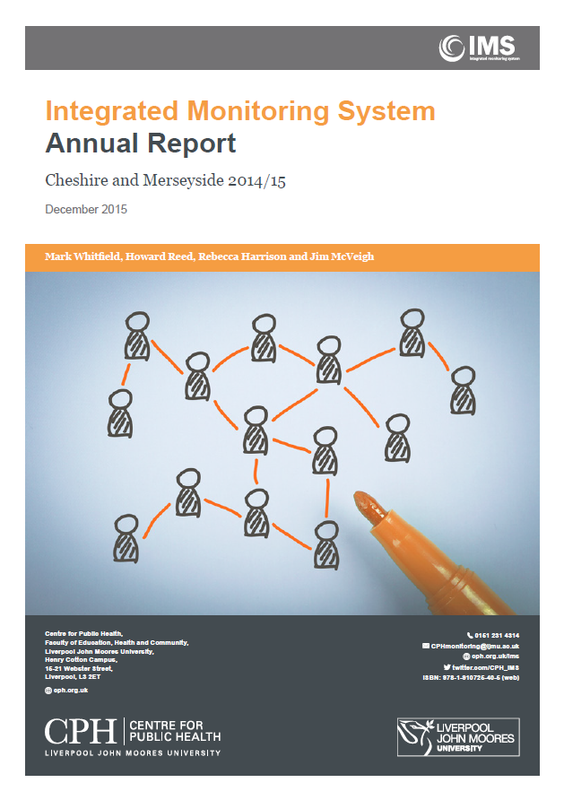 This is the second annual report for the Integrated Monitoring System (IMS) which details activity across Merseyside and Cheshire over the period of the 2014-15 financial year. The data is cross-matched with figures from the National Drug Treatment Monitoring System (NDTMS) and the Drug Intervention Programme (DIP) to provide a report inclusive of every individual in contact with any drug or alcohol treatment/low threshold or syringe-exchange service in each of the nine Local Authority areas in Cheshire and Merseyside. 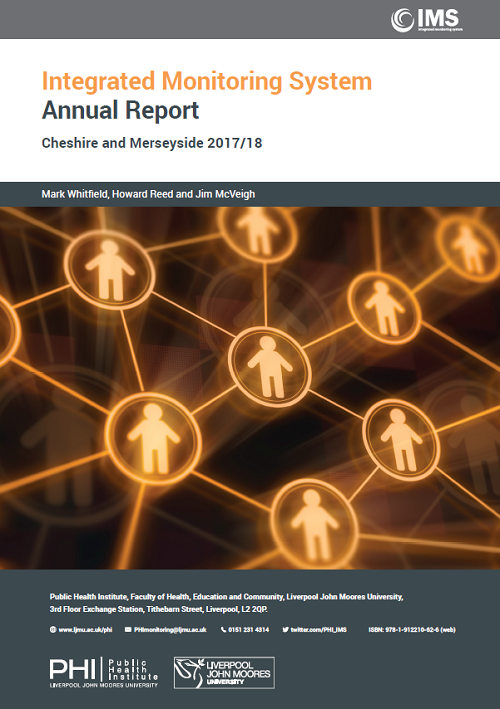 This is the first annual report for the IMS (Integrated Monitoring System), which includes the information previously reported in “Drug and Alcohol Treatment in Cheshire and Merseyside” and “IAD (Inter-Agency Database) NSP (Needle and Syringe Programme)” reports, along with an overview of significant developments in terms of policy and publications in the field of drugs and alcohol research. 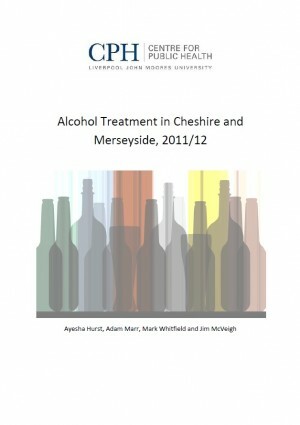 The monitoring of Drug and alcohol use across Merseyside and Cheshire goes beyond structured services – the 2012/13 Drug and Alcohol Treatment report brings together all interventions delivered across the region including those provided by low threshold services which work with client groups catered for outside of mainstream provision. The report provides analysis of information collected from ATMS and the GOLIATH (NSTMS) monitoring systems, as well as highlighting developments and research in the field of drugs and alcohol during the 2012/13 financial year. 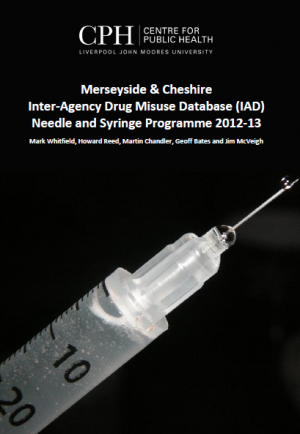 The IAD (Inter Agency Database) report for 2012/13 brings together data from syringe exchange services provided within an agency and pharmacy setting across Merseyside and Cheshire, with analysis of demographics, substance use and presentations to structured drug services through cross matching with NDTMS data. 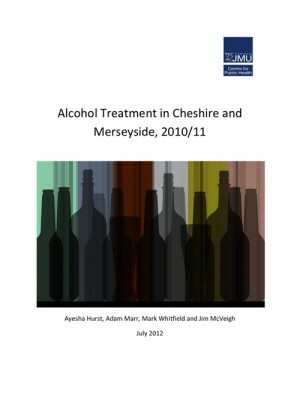 This publication details the results of the tier 3 and 4 (structured) National Drug Treatment Monitoring System (NDTMS) and the tier 2 (non structured) Alcohol Treatment Monitoring System (ATMS) in Cheshire and Merseyside during 2011/12. 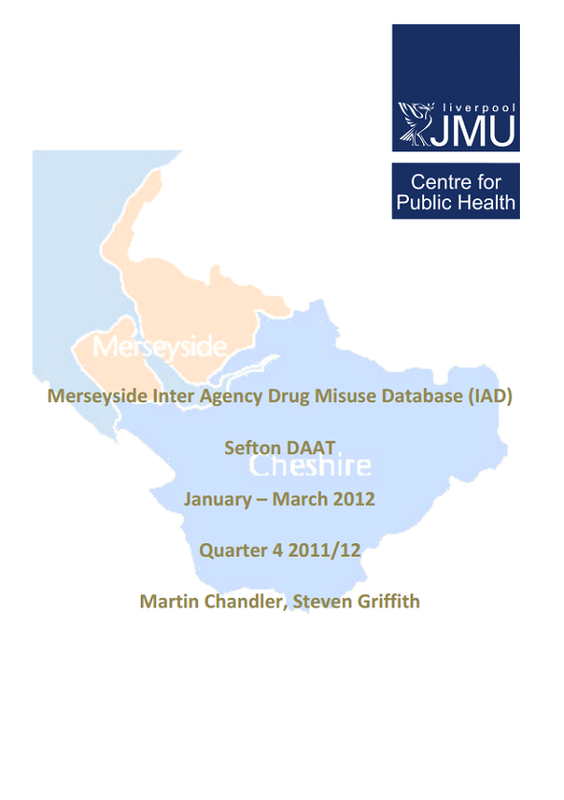 Archived quarterly reports from the Inter Agency Drug Misuse Database (IAD) which was established by Merseyside Drug (and Alcohol) Action Teams, Merseyside Police, and the Centre for Public Health in 1997.